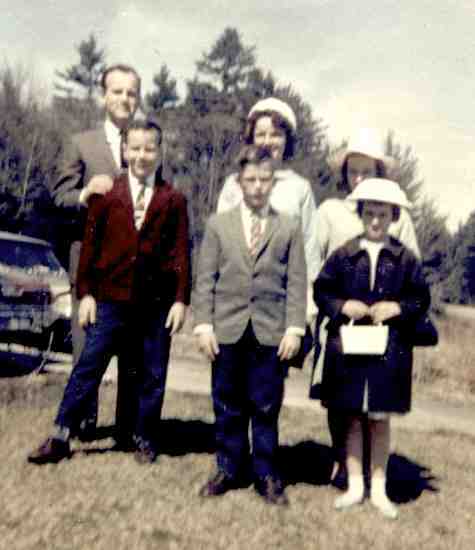 My family at Easter, probably 1964 - I'm in back, behind my sister. Easter's pretty early this year. Are you ready? I used to hide Easter baskets for my kids and hide jelly beans and chocolate eggs for my nieces and nephews to find. The year we lived in a motel, I hid chocolate eggs for the staff and visitors. I forgot they had cameras around the place - that made it a bit easier for them to go back and find them after watching me hide them! I haven't had any one to hide eggs for now for a few years, but the next batch of kids is coming up. Nieces and nephews and my daughter all have kids...now if we can just get them together in one place some Easter, we'll have a good hunt again! I wish kids still dressed up for Easter. Where are the shiny, black patten leather shoes, the frilly hats, the white gloves, the pastel dresses, the suits and ties? Sigh. "In your Easter bonnet, with all the frills upon it..." I remember those days when our family WAS an Easter parade marching into church in all our Easter finery. We were so excited to get the new clothes on. We always hoped there wouldn't be snow, so you could actually wear those new shoes and lighter jackets. I should probably speak for myself, though. I don't think my brothers were exactly champing at the bit to get into a sports jacket and neck tie. I'm pretty sure they'd have rather had their sneakers on. But they knew they didn't have a choice. I'll be in church today (this post is scheduled for Sunday again). I will wear a purple outfit, but no hat or gloves. We will sing and listen to a message about Jesus' love for us, how God sent us his Son for a while, how He died to cover the payment due for our sins, and how He rose again, victorious. We are reminded that if we would accept His gift we'd have Eternal life. I am looking forward to the day that I will meet Him face to face. And on THAT day, I will be in my VERY best Easter finery. I am really looking forward to that shiny, new body! This old one is getting a bit tattered and wrinkled! Slice 31 of 31! Done! Thank you Stacey and Ruth at Two Writing Teachers. for hosting this challenge this month. I've posted for every day this month! Yea! 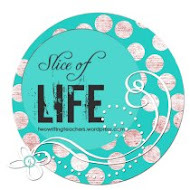 I'll join you on Slice of Life Tuesdays and again next March! Hope to read everyone there soon! Bring on the A to Z Challenge! I'll have post a day (except on Sundays); one for each letter of the alphabet. And since it is Poetry Month, I'll be posting poems every day on my A to Z posts. Tomorrow the theme is revealed...maybe you can guess what I've been photographing all March around here. That's kind of a hint. The rivers are doing their spring thing. Couldn't capture a good picture today, but it was a stupendous day to be out! I linked the words in the poem to the FreeDictionary. Steeving and reeving are both nautical terms. Steeving is when the boat's hull is up above the horizon. And reeving means to pass (a rope or cable) through an eye or other narrow opening! I haven't gone by the river yet, but we made a brief stop at the house, and as we came up to the porch to come inside...what should flit by us and alight on our porch, but a beautiful Nymphalis antiopa (or Mourning Cloak) butterfly! Gorgeous and the first one of the season! I can't believe it's Slice 29! Two more to go! Read more of the March Slice of Life posts at Two Writing Teachers! And it's Poetry Friday! Check out more at A Year of Reading with this week's host, Mary Lee. This poem came out of a conversation on GoogleChat that I had with my daughter on Wednesday morning. Her son woke up in the middle of the night and needed some comfort and a humidifier for his stuffiness. I copied our conversation into a document and then began to play with it, because although you may think I always talk in rhyme, it doesn't happen all the time. ~ Oh, no. Anyway, I wrote this poem for her, for me and for all moms (oh, how tempting to say "that be" at the end, but I won't, because I do not talk in rhymes, my friend...sorry, it just came out). And then she was blessed with your best good-night sneeze. Forgotten the nighttime all screamy and whiny. All thoughts of last night were swept under the rug. But a kid’s well-timed hug can mess with your brain! And sweet memories instead are placed there. I don't remember nearly as many difficult days as I do marvelous days with my children. I bought lunch for the person behind me in the McDonald's drive-thru on Tuesday. It's fun. If you haven't done that yet, you need to try it. It isn't expensive, and hopefully it makes someone's day just a bit brighter! Of course, you won't know how it made it brighter or whose day you made shinier...but you can just imagine the happy, little surprise it must have been to the recipient! My husband and I make a sporadic, totally random habit of paying someone's bill at a restaurant - sometimes it's a young couple, sometimes an older couple, sometimes it's a parent with a child. It's funny, but my husband and I are on the same wavelength here. We both seem to get the idea at the same time and for the same person or people. We don't even do it that often. It's just something that suddenly bubbles up inside of us, and we have to do it. We'll just smile at each other, with a "Are you thinking what I'm thinking?" look. Our meal gifting is always anonymous. We hardly ever get to see the recipient's reaction...except for one time. We were at a restaurant waiting to be seated and there were a couple of ladies "from away" (summer visitors) who were also waiting. Though they were there before us, the hostess called us first. As I went up to ask if she had made a mistake, one of the ladies spoke up and abruptly insisted that they were next. My mouth just dropped open. We got to see how it can change an outlook, even it if was just for a bit. And it gave us something to smile about, too. Oh, those dumb CAPTCHA's...they ARE irritating! Last March we had some great CAPTCHA poetry posted. And Maria mentioned her frustration with them yesterday. 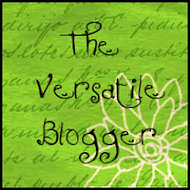 I just thought I'd add some of my discoveries about these little blogging helpers/hinderers! 1. Don't allow "anonymous" commenting, and you are pretty well protected without them. 2. Turn on comment moderation so nothing goes up without going through your email first, for you to okay and post. 1. Did you know that you can skip typing in the numerals? That picture doesn't do a thing. So skip the blurry picture! Try it on your next comment with a captcha. Do just the letters - skip the pictured numerals. It WILL accept just the letters. 2. If you can't read the letters just click on the side circular arrow to ask for a new one. The second time it is often clearer, I've found. Do it until you get something you can read! 3. There is a little audio button on the side, also. It reads off some numerals. I wouldn't suggest doing the audio help! If you think the letters are hard to read, you should hear the recording! Try clicking on the audio button - just for the fun of it! 4. After listening to the audio, go back and type the letters. You will think the letters are very easy now! 5. Also, the word does not have to be typed with the capitals. Use all lower case! Thanks for the tip, Elsie!!!! Okay, that's all I've got! Hope it makes being CAPTCHA-ed more pleasant next time! I don't know exactly where this came from inside me. I just started writing Monday afternoon, and I started with gibberish, just writing nonsense in a child's voice. Then this emerged all in one short sitting, with very few edits. I think it started when I began thinking about being too small to see what was cooking on the stove. Then my visit last month to my daughter's, spending time with an 18 month old who hears everything and repeats it came to my thoughts. It was fun to hear him repeat "Wow!" or "Oh, no, no, no!" that he'd just heard. Lately I've heard people say things in front of their young ones, believing, or wanting to believe, that they are too young to understand, so it's all right. I think they are wrong. Everything's going in even if it doesn't come out right away. Please, always take care with words and actions in front of little ones. Most people were careful overhead when I was a young child. I am grateful for that. When we first moved back to Maine, we had looked at quite a few houses to buy before finally settling on one that we said "would do for now". We ended up living there 10 years before we came to our senses and remembered that it had been a temporary place. We had purchased a piece of land a few years after the move, but hadn't done anything with it. On the day we became aware of how long we'd been living our temporary life, we started thinking about building on our land. We settled on two possible homes to have built there. I described the houses to our teens; I told them option 1 was a log home, with huge windows and cathedral ceiling, and option 2 would be very much like the house we were in at the time, a cape...as soon as the words came out of my mouth "very much like this house", my husband and I looked at each other, and we knew that would not be the house we would build. It was time for different. And now we are about the business of doing something totally different again, 14 years later. This time it is because we are both getting near retirement. It seems that we can make the best changes when we just change everything around us. Besides, (have I ever blogged about the fire?) we know we can live with less. So we rescued an old house - small, old house - very small, old house near the ocean. It was unlivable with no heat, no bathroom, no insulation. 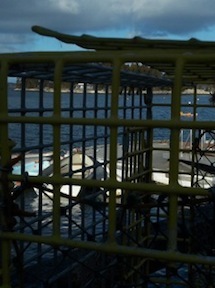 But it was built in 1900 by a Maine boat builder, so it was still in good shape structurally. 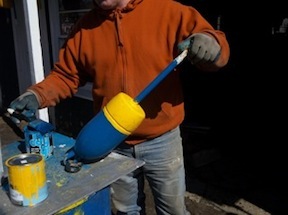 I have made some bold color choices and some other radical choices for this home that are unlike any I've done before. I'm excited about my Bittersweet Rose bathroom and Daffodil yellow guest/sewing room. So Radical Move #1 is color. There are colors on my walls in every room. No cream, no white, no taupe, no dreaded beige. Color. Delft blue, Ocean, Seaweed, Pistachio Ice...I'm excited. I love our pine walls and floor now in the log home. But it's time for something totally different. Radical Move #2: I am putting in two smaller dishwashers, so that I won't have to unload a dishwasher. One will store dirty dishes, and the one that doesn't have dirty dishes will hold the clean dishes. I'll just rotate from one to the other. It seems radical to me, but I'm hoping also just practical. It takes up a cabinet space, but it really is the cabinet space, too. It will hopefully eliminate one unnecessary handling of dishes. I hope what I'm picturing is in real life possible. If anyone has tried this and found it doesn't work, let me know soon! Radical Move #3 is also a practical space-saving option: a washer/dryer combo unit. No, it isn't a washer with dryer over. It is a washer that, after washing, then dries your clothes. My only concern here is that even though there are only two of us in the house, we still have different kinds of clothes. So if I don't have enough for a wash load, I don't do it. Maybe I'll have to get used to smaller loads at a time. I also like to wash a load while I am drying a load, and that won't be possible. However, if I get better at managing my wash loads, perhaps it will work out fine. Radical Move #4: The vacuum cleaner. That will be built in. I had central vac once years ago, and dragging and storing the hose was a bit cumbersome. But this one has a retractable hose. No hose storage, one connector. Radical - and quiet. Radical Move #5: Our heating system is radiant in floor. Ah! My favorite - NO, N-O, NO hot air blowing, no heat ducts, no baseboard, no wall radiators, etc.! The heat is evenly distributed. Baseboard heat is what we've normally had, and I am always knocking off pieces and end caps when I vacuum or when a chair hits one. Plus there's the "don't block the heat" issue with furniture. We get every square inch of floor space to use as we see fit. I am excited about this. Oh, and I forgot to mention how much I hate to clean baseboard heaters. I'm getting even more excited. Radical Move #6: Easy-clean bathrooms. The toilet is attached to the wall instead of the floor, so I can damp mop, dust, etc. under and around the toilet. No squeezing between a wall and toilet to clean. No curlicues on the base of the toilet to wipe down. Easy-peasy to clean! And the tank for each toilet is in the wall. The sinks are also wall mounted with no base no pipes showing. We didn't really have room for a base unit in there, and I wanted clean lines. Very minimalist and radical. Oh, and we don't have a bathtub. We have a larger shower upstairs instead. There would be room for a bathtub if anyone wanted to put one in there someday, but for now - none. We have never used our tub in our spare bath. Shower, yes. Tub, no. There may be some other radical moves later. I am not sure, though I think radical move #7 will be living there. We will not be stuck behind trees to shelter us from neighbors. I will have to actually get dressed to take the dog out. Yup, Radical Move #7: Getting dressed. What time it is any more. I am not positive, but I am fairly sure you are looking at the last of the snowmen for this year. Spring snowmen don't last long, and these are pretty tiny, so melting will be fast! As I came to a turnoff near our road, there sat these five mini-snowmen on the snowbank. My guess is that on our snow day Tuesday, the neighborhood kids were out and about and decided to make some little neighborhood greeters. But you know, it could just as well have been the neighborhood adults! There is something about snow that makes you a kid again (after the snowblowing, shoveling, cleaning off the car, raking the roof, etc.)! If there is any energy left, you become a kid again. If you are truly a kid at heart, then the metamorphosis is quick, and you do the kid stuff BEFORE the adult stuff while you still have the energy! Snowballs, snowmen, snow angels first, then snow work...then back to a kid as you unload your snow gear and grab a hot drink. Then you go find some heat source and stand close to close to it. My favorite is backing up to the wood stove with hot chocolate in hand feeling the steam rise off me and my drink. Spring must feel so delicious to the outdoors - everything is melty and steaming as the earth backs up to the sun again. Soon we'll not have to back up to the wood stove. The snowmen will all be melted. I hate when it's too hot outside. I need an ice cream! This is Slice 22 of 31 at Two Writing Teachers AND, it's Poetry Friday hosted at Greg's place, Gotta Book. Stop in for a visits at both places! I was standing at the kitchen sink tonight, when suddenly the setting sun behind me shot a bright orange ray past me to light up the three Red Rose Tea owls on my kitchen windowsill. I quickly snapped a picture before the sun moved on. I guess it means, just put up the owl poems. Then I found this poem in my "stack of papers" in a file on my computer, that I wrote a couple of years ago. It seems that I'm finding I have a connection with these birds that I wasn't quite aware of. That he spies on the ground. A poor mouse with that sound? And lastly, I just remembered something I made with a second grade class a few years back when I taught technology...I just put it up on YouTube...and here it is...short, sweet, owl and mouse..."paper-mation" video...not a poem. I've been working on my posts, which will be short poems, in April for the A to Z Challenge, so I can just tweak them instead of starting from scratch. Last year, I had all but maybe 2 done for April before it started. I'm still working on E, G, U, W, X, Y and Z. I'm getting there! But I have to have a little bit better weather to finish. I'm taking pictures, and the weather can't be so good that it doesn't make sense, but not so bad that I can't get to where I need to be or see it! So those are all your hints about my theme! I'm thinking of cheating on a couple of letters... as in the letter might need to be in the word I'm going for. But we'll see. Could be there's an X out there. I'm pretty sure there is a Z. I just have to find it! I posted an A to Z recap back in May 2012. Yesterday, I messed with the timing in my video some, so I think it's better. I made it using all my images from the A to Z Challenge last year, set to music (permission granted) by Dream English. The images go from A (arms) to Z (zebra stripes), and are Tagxedos made with words from poems that I did with each one. If you want to read the actual poems and see the words longer on screen, you will have to go back to my April 2012 posts. Here's where to find A is for Arms. The rest are under the drop down for April 2012. 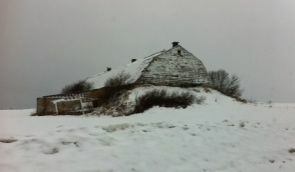 A to Z Blog Challenge 2012 - Mobile from Donna Smith on Vimeo. Tomorrow is Friday. Don't forget Poetry Friday. It's Spring! Can you see it? We had another nice big snowstorm on Tuesday. It was a beautiful storm that I woke up to, having slept in the living room sitting pretty much upright. And slept isn't quite the word for what I did. I was having some back problems brought on by my fall a week ago, on top of riding in the car on rough roads on Monday. I just had trouble lying down. So I was up until around 2 am, tried the bed, got up and tried the chair with pillow under my chin to keep my head from tilting forward. (No one took pictures of that.) It worked off and on until about 7:30 that morning. And in the light, I could see the gorgeous snow coming down. It looked like we already had about 4 to 6 inches. All day yesterday and into the night it continued to snow. 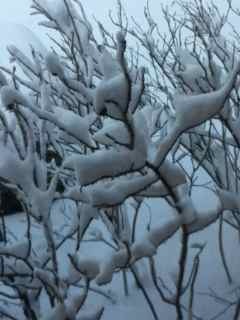 This morning we awoke to a sunny day with branches softly carrying their balls of cold cotton. 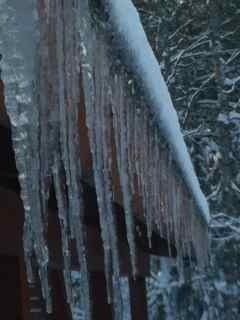 The icy fingers of winter haven't yet quite loosed their grip! But this cold and wintry morning will melt soon. I'm already seeing snow fall from warming branches, though it's a mere 21 degrees outside. you will flee by this afternoon! Can you see her shadow? I wrote this a while ago...just found it looking through files for an idea for today. It's not that warm yet, so let's just pretend we're on a tropical island instead of an island on the coast of Maine...I'm going to see what this format looks like online. It isn't easy to do what I wanted to do here, which is make the poem into a palm tree shape. Oh, well. You can just imagine that it looks great! To all who read my poem "A Rhetorical Question?" and the lullaby by Angie, and took the time to vote - for either poem - thank you! I will be writing a poem a day in April for Poetry Month and participating in the A to Z Challenge. Hope you stop back for some visits here again! Out here we often have a visit from a Northern Barred Owl. Yesterday morning, we had one visit. He actually wasn't visiting us though, it turns out. There was another Barred Owl, not far away. So when he was saying "Whoo-whoo-are-you, Whoo-whoo-are-you?" he probably was talking to a potential mate and not to his dinner. Both my husband and I could hear him from inside the house, so knew he was close by, probably in one of the oak trees in the front yard. We stepped outside onto the front porch to listen better. The call came from somewhere in front of us and not too awfully high up, but still we couldn't see. And then we heard a return call off to the left, a bit deeper into the woods. Then we saw him. He was large, gorgeous and silent as he swept down out of the tree in front of us and ghosted into the depths of the woods to meet his companion. Wow. I would have loved to have been able to take a picture. Even if I'd thought ahead of time to bring my camera or phone out, I'm not sure I would have been quick enough. First I would have had to stop watching...and I don't think I could have done that. My husband said to look up Barred Owl, and when I did, there he was, there his voice was, and the area he resided in was a larger area that included our own. They said in this article that the Spotted Owl is endangered and the Barred Owl is reaching farther East into the Spotted Owl territory, threatening their existence as they both eat the same prey. It was interesting that a Spotted Owl will stand by in a nearby tree and do nothing as a predator eats the eggs or babies in their nest. That can't help their existence either. I had a good time reading about them. If you would like to do more reading about the Barred Owl and hear their call - try this site. 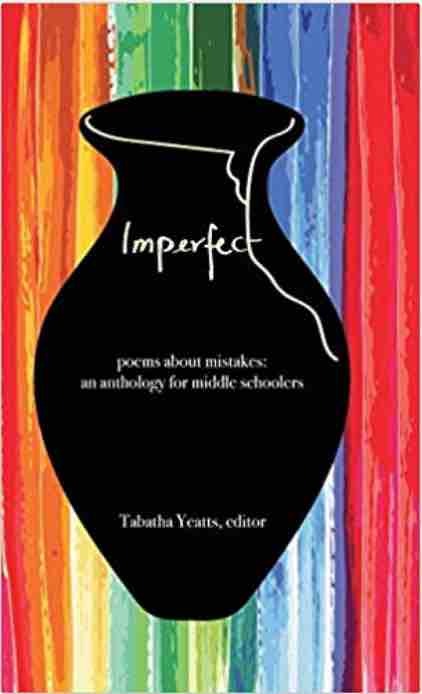 If you would like to read my Barred Owl poem (using the word rhetoric) and other great poems in the March Madness 2013 Poetry Tournament...go here. And do some voting for your favorite poems while you are there! Last weekend my husband and I spent Saturday riding around the islands and peninsulas. He was such a kind chauffeur to me as we abruptly stopped, turned around and backed up all afternoon, allowing me to either take a picture with the window rolled down or jump out of the car to snap a photo. In a very "unlike me manner", I even stopped to talk to people, and ask if I could take some pictures. And because of that daring, I even met a book publisher on my photo trek. I'm going to submit a couple of poems for possible acceptance in the anthology she's publishing later this year. Maybe that will be a start along with the MM 2013 anthology... that would be fun! 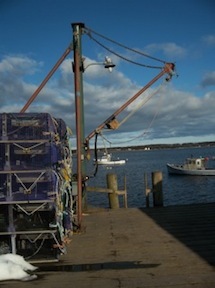 On the working dock at Five Islands. Spring is in the air here! 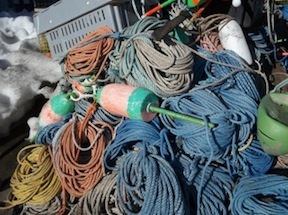 Boats are being readied, along with traps, buoys and lines. 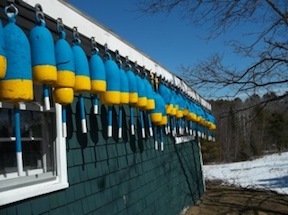 Some are expecting to get out on the water as early as May 1 this year. Oh, yeah! I can smell it, I can taste it, I can hear it and see it and feel it! Quick reminder of March Madness 2013 Poetry Tournament will be available for voting around 1 pm Eastern time TODAY and Monday! Look for my "rhetoric" poem! That's my word for Round 2! Enjoy lots of great brand new written under duress poems!!! And vote! Yesterday was an awesome day. Way awesome. Some awful good kinda day. Wicked good. I got to spend some quality time with my mother-in-law - a five hour drive away through sparsely populated areas with plentiful populations of trees, moose, coyotes and deer. 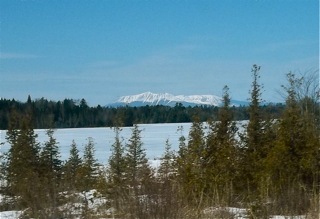 I got to see Mount Katahdin all snowy and majestic against a gorgeous light blue sky on the drive home - even though I couldn't get a good picture while I was driving. I got to see a bald eagle soaring overhead as I drove through the logging areas. - a sign by the side of the road said "Watch for 'Eagles' in the road." I got to watch my poem "The Seasoning of Spring" make it through the first round of the March Madness 2013 Poetry Tournament. - that was an amazing first round! I got my new word for Round 2. - it's challenging, well, challenging's not the word, it's what it is! I wrote a poem using the word last night, while I was in the car. - I think I like it enough, but I'll probably write at least one more, as I did last time, and see which one I like best before I submit. But at least I have a poem. If anything happens to keep me from writing another, I have something to submit, and it is working pretty well for me. So it was some kinda awesome day yesterday. Bring it on, today! The poems got posted late last night, just after midnight while I was asleep! I went to all the entries and placed my votes! Wow! There are some really great poems out there - especially considering the words given to work with, the timeframe for creating, and the challenge of just coming up with something on short notice with life and all being what it is. But the first ones have been written and posted, and the voting has begun! I'm exhausted! I don't think writing is exactly at the same level as riding a bike or running, but still exhausting. If you get a chance...and you should really try to...go to Think Kid Think and read the selections! You won't be disappointed. Read some of the writer banter in the comments. Add some banter of your own. Consider having your class vote at school with one vote. Encourage them to vote at home. One vote per person please! 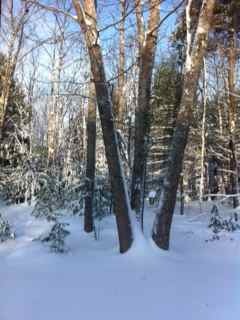 I'm up in way northern Maine today...enjoying the last bits of winter...though my poem was of spring! Well, yesterday I wrote my poem for the March Madness 2013 Poetry Tournament and submitted it late last night. We had 36 hours to compose a poem using our given word. Mine was "tincture". My opponent's word was "dismissal". The poems will be posted for voting on this afternoon and Thursday. You just NEED to go there and vote for your favorite poems. It will not only be fun, it will encourage poets to write poems! It would be great if teachers could get their classes involved and have them vote from home even. I know that sometimes it is a problem having classes vote at school, unless each student has their own computer there. At the very least having your class read and discuss the poems would be wonderful and maybe having a class favorite vote on the poems. Here are my attempts at "tincture"...ones that didn't make my cut. In my first attempt, though I liked the internal rhyming and the pattern of the rhymes, I just didn't like the flow, and it seems like there would be way too many words for the kids reading it to decipher and retreat to dictionaries for. It shows you and students that you don't have to go with what you got first, or even last. Keep messing with it. Sleep on it. I slept the night between my first poem and the one I went with. I wrote the third poem later in the evening, which I also discarded for the competition. You can see how crazy this was! I don't think I'll show you my page of notations from which I worked. But I always have a notes page with jotted rhymes and extra words that I think might apply, most of which I never use. warns behaviors like this’ll, be grounds for dismissal! And actually I have a different ending for it, too. But this is quite enough for thought. I was torn with my three poems. But today you can see what I went with and make the decision yourself. Did I pick the right one? What do your students think? Don't forget to vote on Wednesday and Thursday at www.thinkkidthink.com! Last night I got my word for the March Madness 2013 Poetry Tournament. Half the authletes got their words, and the other half will get them tomorrow. We each have a different word and will be writing a poem over the next 36 hours using that word. The poems will be posted this Wednesday for the first flight of poems and Thursday for the second flight of poems.. You just NEED to go there and vote for your favorite poems. They should be some remarkable pieces. The word bank had to be incredible this year - the words range from pretty solid words we might use every day to words that most have never even said in their entire lives, and have never even planned to say, ever, and would have to look up in a dictionary and maybe even have it pronounced for them if they wanted to use them someday like today. That being said, I am lame and stiff after Sunday's stairway routine. I am going to hold the railing ALWAYS from now on. I am going to consolidate my belongings so I can have a hand free to do that. And if it is dark, I am going to go more slowly and cautiously, feeling for each step before I decide to do any more pirouettes. There just isn't enough room in the stairwell to do one well, and a tour jette is right out! Must sit here a spell and write really well. Grab a cookie to chew, and spew a rhyme or two. Turn the heat pad to hot, and don't move from this spot. Sit down where it's cozy, and with computer compose-y... my poem! Don't forget to vote on Wednesday and Thursday! At first glance one might say yesterday was a not-so-good day. But reflecting on it, I see that yesterday was a so-good-near-to-marvelous day. I started out being sick. But by the end of the day I was all better. So that was the first 180 I did. Then, in the evening, leaving our church's upstairs auditorium, I fell down the stairs. It was a well executed fall really - almost a head over teakettle fall. I think it would have scored a 9.5 in the Women Over 60 Division of the Curved Stairs to Landing Double Free Fall. I skipped over two steps heading downstairs to the first stairway landing, where I bounced off the wall, missing the window. Once there, I performed a half-pirouette, a beautiful 180, before my headlong, backwards decent to the next set of steps above the second stairway landing. I think I aced the dismount with feet pointed to the ceiling, legs balanced on the stairs above me. My graceful dismount included a spontaneous flourish as I swung my legs a full 90 degrees down from the stairs to be level with my upper body resting on the lower stairway landing. I discretely pulled my skirt back down from my face and held the dismount for the required 5 seconds. I may have lingered on the dismount a few more seconds, or maybe it was minutes, while I took inventory of my performance. You might say, that would certainly qualify as a contender for "The Not So Good Day Springtime Awards of 2013". But I was not broken, and today I'm merely a bit stiff with a sore right hand, arm and shoulder. 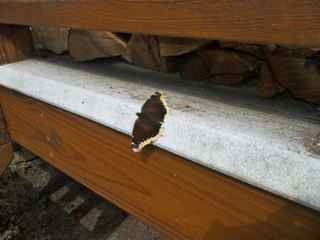 There are, thus far, no marks other than a skinned knuckle where I hit the wall on the first landing. No one can see my bruised pride. My iPad, iPhone and camera were not broken. But best of all... the judges were all women. You may have been able to detect my bruised pride if there had been any men present. We're getting lots of good mud here. I think Maine's official Mud Season has begun. There are ruts galore, potholes sinking down everywhere and frost heaves making stunt ramps! We dodge and weave like we're in invisible traffic. But when it's mud season, it is also maple syrup season! The maples have all begun to carry buckets. It's the beginning of the sap run, so maple syrup lovers will have a fresh batch shortly. I told Elsie that I'd make maple cookies in honor of the spring smells that are happening lately. I'd never made maple cookies before, so I went online and looked for a promising recipe. This is the one I found: Maple Cookies Recipe at Simply Recipes. The cookies turned out absolutely delicious. I followed the recipe to a "T"..pretty much...right until I made a mistake. Then I veered off. Mistake 1: The recipe calls for 1 tsp of vanilla. I reached up and grabbed my vanilla out of the cupboard. I poured out a tsp. I noticed that it was a clear liquid, but it still didn't register that vanilla should be dark. I quickly dumped it in on top of the brown sugar that was in the bowl. The vanilla wasn't supposed to go in then, but I was saving time - it shouldn't make a difference. I could smell immediately that it wasn't vanilla I'd just poured all over my cup of sugar. I looked at the bottle. Almond Extract. I had to make a decision. Do I try to get some of it out and add some vanilla and more sugar to replace what I had to ditch? Or do I go with the flow and see how they taste with almond instead of vanilla? I decided to go with the flow. Mistake 2: The recipe calls for 1/2 c of maple syrup preferably Grade B. I only have Grade A. I decide to go with the Grade A and just see if we like it. However, Grade A does not have a strong a taste as Grade B, and I've just put almond in the recipe instead of vanilla. Will the almond just really overpower the syrup flavor? Okay, if it does, we may like it anyway. Go with Grade A. Mistake 3: The recipe calls for 1/2 c of maple syrup...didn't I already say that? Yes. But I wasn't through messing that up. I took out my 2 cup measure. I filled it half full. Half of a two cup measure is what, everyone? That's right class. It is 1 cup. I dumped it in with the sugar, almond and butter that had been blended together. I stared at it aghast. What did I just do? I looked at the recipe again to see if there was some other liquid in the recipe that the maple syrup could be a substitute for. Nope. No water, no oil, no milk, no honey. I had twice as much maple syrup as I needed in the mixture. Time to double the recipe. Mistake 4: I doubled the recipe. Almost. I mixed all ingredients again, so the syrup would be the correct amount...another egg, more butter, double flour, baking soda, salt, etc. No nuts yet. I needed to wait on folding in the nuts until everything was mixed. Instead of almond, here was my chance to get this part half right. I added 1 tsp of vanilla. Next the nuts. I reached in the refrigerator for the walnuts. I didn't have walnuts. I got out chopped pecans instead. Those should be fine, I thought. They would be richer than walnuts. I even liked them better. They are much more expensive, but I'm worth it. Mistake 5: I got out chopped pecans. I know I already said that, but again I wasn't through messing this part up. I forgot that I was doubling the recipe. I read the recipe 3/4 c walnuts. I put in 3/4 c pecans - half the amount I should have. I didn't realize this until my husband took a bite of a cookie and said, "These would be good with nuts in them." He must have gotten a cookie from the wrong half of the bowl of batter. Mistake 6: Oh, wait. There was no mistake 6. There were no mistakes at all for that matter. We decided the amount of nuts was just right after all. We liked the almond extract mixed with the vanilla. Grade A maple syrup had just the right flavor. I just made up my own recipe for delicious Almond Pecan Maple Syrup Cookies. They are really delicious. Try one, you'll like it. Go on. Take two; I have twice as many as I need. If you have young ones, try finding the Curious George video called Maple Monkey Madness from season 6 episode 7 on PBS, or somewhere out there in video land. It is a great way for the young ones to learn about making maple syrup. And at last, here's a video of how to make maple syrup. In two weeks it will be Maine Maple Sunday. Celebrate it. Get some maple syrup and pour it over pancakes for breakfast and over ice cream for dessert! Make half a batch of my Maple Almond Pecan Cookies! A phone call changed my post for today. I had a marvelous day other than that, full of great happenings that I will wait to share until later. I'll write and post the good stuff for tomorrow. For today, this seemed to need to be written instead. Ed DeCaria at Think Kid Think is beginning the new March Madness poetry competition for 2013. On March 11, I'll receive my first word, along with 32 other poets. The next day the other half of the poet/authletes will receive their words. We each have 36 hours to write a poem using the word we've been assigned. Check in next week on Wednesday (the 13th) afternoon and then Thursday (the 14th) to vote on the first set of poems. Anyone may vote one time. If you have a class of students, get them to read and vote on their favorites, too! After all, these poems are written for everyone! Clicking on the link above or on the image at the top of the sidebar will bring you to the competition! Here is a poem I wrote about the competition just to get me started - no voting yet! And make up a rhyme. For March 11th to see. As best rhymes are played. Are just 'round the bend. The Great His or Her Radness! Gets the trophy, The Thinkier. I found this old post card for sale on the Internet, and just had to buy it! What wonderful memories I have of this place. It's changed quite a bit, mostly due to my grandparents. My grandparents were born and raised in Newfoundland. They lived in Pouch Cove where Grampie was a lobsterman and Nannie was a seamstress. As a young couple, in the late 1920's, they moved to the states and settled in Chelsea, Massachusetts. My grandfather had a scrapyard there. My father told me that he loved being at the scrapyard with his dad and playing in the all the old cars. My grandfather told me that it was dangerous. I couldn't imagine any more magical a place to play though! Nannie was a seamstress, making clothing and doing alterations. We lived close enough by to visit pretty regularly in their second floor apartment. I remember watching tv on their new roundish screened television set. Lawrence Welk was a favorite, along with Howdy Doody. They were the first to own a tv in our entire family. They were the first to throw out the old to embrace the new. My family moved to Maine, and soon after that my grandparents followed. We moved to a big old house out in the country, but my grandparents moved into a newish 1940's tiny look alike house community in town - which is still there pretty much unchanged from when I was 6 years old. My grandmother became the manager of a dress factory, and my grandfather worked there, too, first unloading huge bales of fabric and then loading dresses. Though they had tried to throw out the old life, being from Newfoundland, they still missed the fishing life. So, unbeknownst to my grandfather, my grandmother bought a little place right on the ocean. He was livid when he found out...at first. I imagine she just laughed at his sputtering. I can hear her laugh now. Her eyes would twinkle and she'd look down trying not to laugh. Then she would start a small chuckle that would develop into an uncontrollable belly laugh that made everyone start laughing. My dad had that laugh, and sometimes when I start laughing and can't stop, I hear her. And I can't help but laugh all the more! My grandfather's sputtering was because this "little" place she bought was the Hotel Germania. 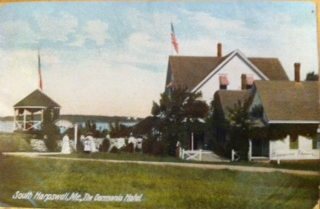 It was located in South Harpswell, which in an earlier era had been host to cruising vessels and would drop off summer tourists to stay at these elaborate hotels on the coast. It was a large building that had not been used in years. I remember going there and quietly peeking in all the guest rooms and finding a dead bird in the corner of one of the rooms. I felt a bit like Alice in Wonderland as I opened and shut doors to little rooms and nooks. The number of doors to choose to open seemed to be endless. I had dreams about that big, old empty house years later even. The dining area was huge. It still had all its tables and chairs set up, ready to serve at a moment's notice - except there was no water or electricity. I wish I could remember more about some aspects of the house. But I was probably only 8 years old at the time, and I was mostly fascinated with this glimpse into the past on a surface level. I enjoyed the exploring more than the questions of how did they cook, was there ever electricity there and such. I do know they didn't have bathrooms that worked anyway. If we needed to go to the bathroom, we had to find a nice quiet spot under the pier. That was impressive evidently! They soon set to the task of selling off the furniture and fixtures, removing the long pier, tearing off the huge dining room and paring down to a nice sized home that overlooked Pott's Harbor. And there, my grandfather set up his lobstering life again, while my grandmother continued to work as manager of a dress factory in town. 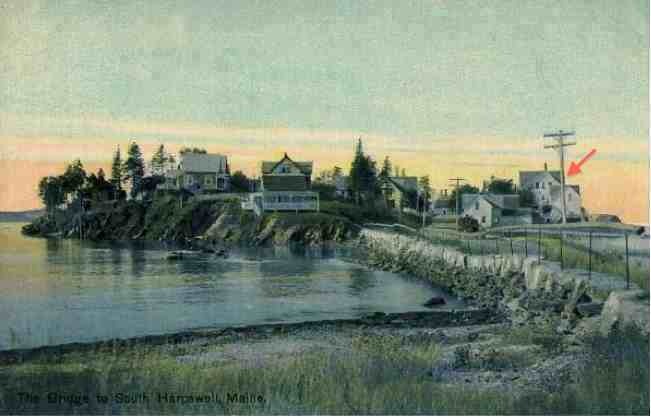 We spent many summer days and nights at my grandparents' home on the harbor. 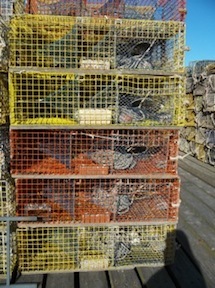 Gramp trapped lobsters. Nannie cooked lobsters, and biscuits, and cabbage with corned beef, and deep dish apple pies. And I climbed rocks and rowed boats and pulled a trap or two and fished and walked deserted islands, and pocketed bits of glass and rocks and shells, and learned to sew and cook. And now my husband is Grampie and I am Nannie to our grandchild. He has begun to recognize our laughs. I want to bring Pouch Cove and Pott's Harbor to him. The new is good, but it needs the old to bring it to life. Edna St. Vincent Millay had a summer home in Harpswell. She died one week before I was born. Here is a link to her collection A Few Figs From Thistles. Just so happens that was my grandfather's last name - Thistle. My favorite poem in this collection reminds me of my post yesterday, though I had never read it before. It is Portrait by a Neighbor. Our first home, well, the first one we bought after a few apartments when we were first married, was a nice little ranch house on Brice's Prairie in Wisconsin. It was in a small development area on nice flat prairie land between the bluffs and near the river. At the end of our street was a dairy farm. I suppose that all the land used to belong to this farmer, since his barn was pretty close to the main road. We were about the fifth house in from the end of the main road. It was a pretty drive to and from our home and work in LaCrosse, Wisconsin, where I was a teachers' aide. I had been a teacher in Maine, but when we moved I had to start over and there were not jobs...but that is another story. Anyway, the huge bluffs, the flat in-betweens, the Mississippi River - all of these were common sights on our drives. Beautiful farms tucked away in valleys at the base of the bluffs, and farms perched on top of the bluffs lay like undulating quilt squares. You know Stevenson's poem The Land of Counterpane...well, that's Wisconsin and Minnesota on the Mississippi River. We were young and newly married when we bought this first house and were not really versed in the care and maintenance of lawns. Our older neighbor, however, was. My husband stopped to chat with him one afternoon. He had a beautiful lawn, so very well kept. And ours was a mass of tangle-haired grass with yellow dandelion pigtails poking out all over it. He told my husband that he'd finally gotten rid of all the dandelions on his lawn. He was probably prompting my husband to ask how he did it. Truly, we didn't even think he was trying to hint about anything. So I can imagine what he thought of us when my husband laughed and told him he'd have more when ours all went to seed. It really was just a statement of fact. Yes, it was dense now looking back on it. We really never talked to him again, and I never did meet his wife. But we didn't stay long there, so that could be the real reason why we didn't get to know them better. It wasn't long after that conversation with the immaculate-lawn neighbor that we got an inkling of how differently we were maintaining our lawn compared to others. Early, early morning (if you can call 4 am morning), I awoke to a noise I'd never heard before. There was a rustling sound and low moans coming from outside our bedroom window. I woke my husband, and we peeked out the window above our bed. Just barely visible in the pre-morning light, we could make out white irregular shapes slowly moving about, lots of them. And now the moaning, with awakened ears, was heard as the mooing of cows. The scene was coming together as we squinted and listened. Our front lawn was covered with black and white cows grazing on our lush lawn. There was not a single cow on any other lawn in the neighborhood. They had broken out of the pasture down the street and headed straight to our house. Forget the other 39 lawns in our development. Why would they stop anywhere else? Everyone knew the grass was always greener, grew longer and had tastier dandelion greens on our side of the fence. "Come on everyone, let's go to the Smith's house! " I wondered how long they'd been planning this great escape. Or... and this is truly, as I'm writing this, the first time I've thought of this possibility in the 38 years since we lived there...could it have been our neighbor? Could he have let them out? We moved to a house farther out in the country shortly after the cow invasion. Our neighbors there had cows, too, but the cows never came to visit. We had grown up a little more. We'd purchased a lawn mower. No more lawn moo-ers for us! I know it's gardening weather somewhere in the world. But it isn't quite here yet up in the northeast corner of the states. But two bulbs are up at my house...the solar powered yard light bulbs... They were exposed and shining a couple of nights ago. We must have finally had enough light during the day to melt back the snow and power them up! Spring at last! I can feel me starting to power up, too! There is such a sense of shivery excitement when I smell spring, and I smelled it this week. It smells like water and mud here in Maine. Some people smell flowers and green growing things and associate them with spring. But here, it is the smell of melting snow (yes, I believe it does have a smell), and the smell of earth warming up - like cookies just starting to bake (yes, earth smell is delicious). It has a wet coldness to it. It may still be 30 degrees or less, but the air has changed from dry and flaky to moist and heavy. Let's go with that: Spring is yummy! It's a bit of honey sweetness added to the dry winter ingredients before the whole summer baked batch of cookies comes out of the oven. It may snow again soon...and even much later. 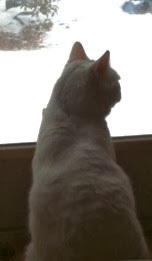 It is snowing again right now. 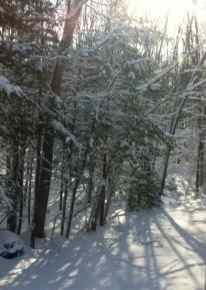 But these snows of March don't last very long and are being changed into Maple syrup even as I write. I can feel the awakening, the powering up. Yesterday at church, I did get my post for today, Jaana. It was in the message that was preached. My brother is the pastor of the church, so he brings in many family stories from our childhood as illustrations - and his memory is so much better than mine! He was talking about faith when he brought up a memory. The memory of our father and his building up of our trust in him. When we were very little he used to have us stand on the counter edge in our old pantry and tell us to jump into his arms. Wow, that was a long way down! You would look down and see the floor almost a whole kid away from your feet, and Dad's face almost level with yours. It was such a long way down back then. Of course, it's a long way down today, too. I can barely step down from a chair I'm using to change a light bulb. Jumping down off things certainly isn't what I do anymore. Wouldn't want to break a hip or an ankle. I remember watching my brothers just leap off into space and Dad catching them to put them safely on the ground. They loved it! They'd do it over and over. Watching them, I could see that it was really only a small space of a jump before they were safely in my father's arms. But when I was up there the idea of jumping off was so scary. I hated it and would stand up there for too long, building up more and more fear of jumping. I don't remember a day I jumped. I don't even know if I did ever. I must have. My dad wasn't one for just letting things go... But I'm pretty sure it would have been just once. My memory is of watching and wondering at how much fun they were having. When I stand on high surfaces, my feet and hands hurt. Even when someone else stands on high surfaces, my feet and hands hurt. When we sanded and stained our house, my husband used scaffolding to get up to the peak of the cathedral ceiling in the living room, and when he was up there, I had to leave the room. I'd rather be on a train than a plane. I'd rather play marbles than swing. I will dive into water from the side of the pool, but not from the diving board. I prefer using 6 flights of stairs to riding an elevator. I like being grounded. But I don't like being restricted by my fears. So sometimes I take a chance...a leap of faith so to speak...and I have never regretted those leaps. Just don't ask me to skydive. Now I'm sitting here and it is just past 11:00 pm Saturday night. I'm trying to think of something to write because I need something before Sunday. Sunday is not a day of writing for me. Sunday is a day of worship, and I use the whole day. What to write about? The deer that were in the yard eating the corn my husband threw out of the garage because the mice had found it? How the buck had caught us watching him from the window and stomped his foot at us before the three ran off into the woods, white tails pointed to the sky? The train ride that nothing happened on, except I got to play lots of "Words With Friends" and "Candy Crush"? More great things about my daughter and grandson? Oh, or... Okay. Got it. I had just gotten back from PA and was in RI with my husband who works in RI, though we live in ME. I was almost ready for lights out when I got a phone call. It was from our son who was caring for our animals - Purrsee and Pippi - while we were away. He works in hospital security and has the 3 to 11pm shift most weeknights, so he had to have been just getting to our house, which is about 20 minutes away from his. We are out in the middle of nowhere...like there is one road to get to our house - 7 miles of one road, over two bridges to get to the second island off the mainland. I had looked at the WeatherChannel on my phone earlier in the day and noticed that the weather was going to be bad there again. It's not the best place to have to drive when the weather's bad. When I answered the phone I asked him what was up...it's after 11 and it's snowing...there has to be something amiss. He asked if I had a key hidden somewhere like in the garage or under a snowbank or something. That meant that he couldn't get in our house, and it was late. He'd forgotten to take our house key when he'd left for work, and it was still back at his house a 20-minute-in-good-weather drive away. I asked him how the driving was. "Terrible. Lots of slush on top of ice, hard to stop, hard to keep from being jerked around in the ruts of ice and slush." So I told him, don't worry about it. Just go home and stay there. The cat is fine. The dog is...well, if she can't make it until morning, we'll just clean up later. "Just go home and stay there"...again I said it. "Don't worry about them"...I repeated. "Okay, mom... I'm getting in the car now...gotta go." "Just go home and stay there. Don't worry about them." Did I say that before? "Drive safely. They'll be fine." "Yup. I'm getting in the car now..."
1:25 am - I hear the beep on my phone. I have a text. I put on my glasses and grab my phone. "Pippi has gone out. Everything's ok."
"I'm glad I didn't know you were doing this or I'd have worried too much." I went to see my daughter and care for her last week after she had her 4 wisdom teeth surgically removed. We had all been concerned about the possibility of nerve damage in her face and neck, as the first dental surgeon had said that a nerve was very close and possibly intertwined around a tooth. The second opinion was different, but still a bit of a concern. The surgery went smoothly and quickly. There was no nerve damage at all! She couldn't pick up her son and couldn't carry him around for the week I was there though. Throbbing and the risk of losing a clot kept her lying pretty low for a few days. I stayed a week and learned more about my grandson while I was there. He is quite a kid now. A toddler of 18 months. A big deal. A walker. A giggler. A watcher of everything. A mimicker of every sound he hears...and he hears everything. I wonder at parents and others who can speak crudely and rudely around young ones, saying that they are too young to understand and they aren't listening and it's going right over their heads. Nope. No, it isn't. On the day I want to talk about, we needed a break from blocks, books, trucks, etc. 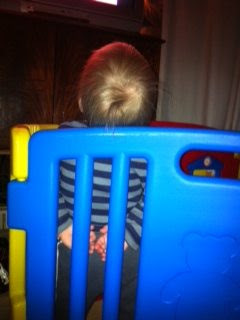 and decided he could watch tv - Netflicks - Mr. Rogers to be exact. So she asked him, "Do you want to watch tv?" (Now, mind you she doesn't do this often and there are only 3 or 4 shows he watches ever. She doesn't even watch tv while he is awake.) Anyway, he said yash...which is yes, of course. And then he said, "Chooch." I asked her what chooch meant and she shrugged her shoulders. So she turned on Mr. Rogers. He looked at Mr. Rogers coming through the door, changing into his sweater, and began to cry. He likes Mr. Rogers. Why was he crying? He stopped crying when trolley came in. Then he started to cry again. Now what? He watched again for a few seconds pointed to the tv and again cried, and said "No, no". I told my daughter that I didn't think he wanted to watch Mr. Rogers for some reason. At which point her face lit up in a look of understanding! Chooch was for choo-choo train! He wanted to watch Thomas! She quickly changed over to Thomas the Train. He looked up at the tv and stood with his hands behind his back as the train came on the tv screen. And then... he turned to look at his mom, and he blew her a kiss! He doesn't say many words yet, but the ones he does say mean something. We have to be careful they don't go right over our heads! It's a big day today! It's the start of the Slice of Life Challenge to post every day in March...and it's Poetry Friday....and the March Madness Poetry Competitors have just been named. I am in for ALL of them! March has come in like a lion! So today, check out other Slices at Two Writing Teachers. And check out some great poetry links for Poetry Friday, hosted this week by Julie Larios at the Drift Record. Ed DeCaria at Think Kid Think has begun the new March Madness poetry competition for 2013, and I am one of the 64 starting authletes. Poets/authletes had to submit a short bit of a poem to express their desire to be a contestant. I have posted my poem below. For more information go to Ed's site (link above). 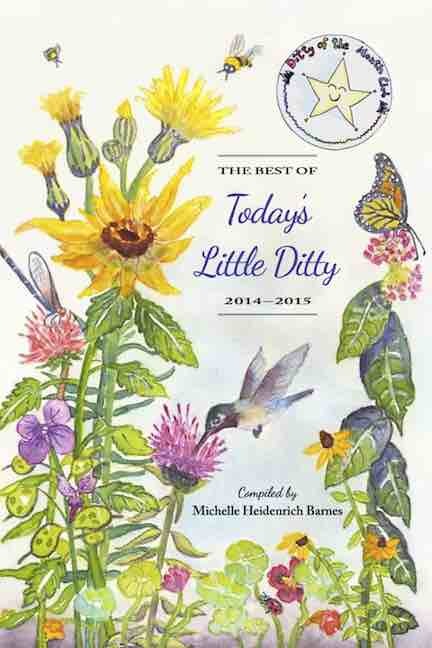 There will be lots of opportunities to read and vote on poems especially written with ages 5 - 15 in mind. Hey, have your students vote! Now that would be some authentic voting! Authletes are paired against each other. Then each is given a random word and a day to write a poem including that word. The poems are posted on Ed's site where anyone may vote for their favorites. Winning authletes will be re-paired with another winning authlete, and each of the remaining authletes will receive a new word to use in a new poem. At the end there will be one winner...the winner of The Thinkier trophy. Exciting times! I am paired with last years winner, Stephen W. Cahill, for this first round of poems! No pressure! This need to make them rhyme! Check into the first round of poems to vote on Wednesday, March 13, with more poems coming from the authletes for the rest of the month.